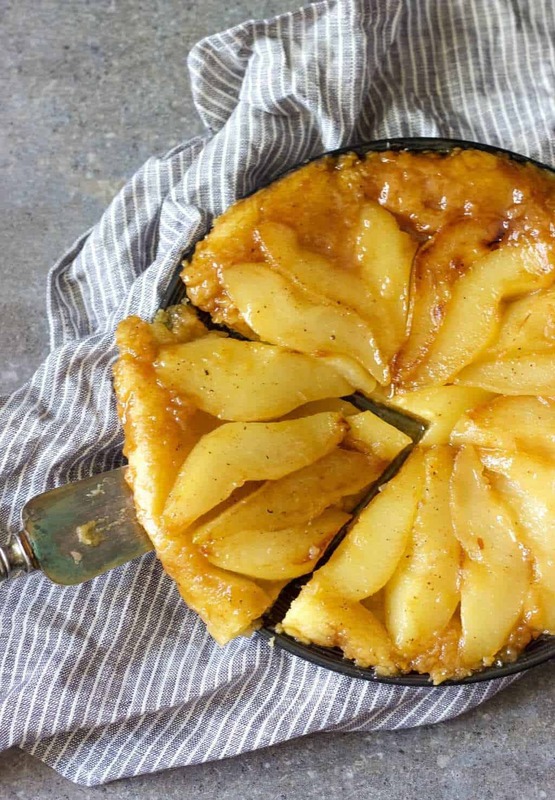 Easy to prepare, moist and flavorful, this Pear Tarte Tatin is a crowd-pleasing dessert. The first time I heard about Tarte Tatin (aka upside-down cake) was about a year ago, during one of the Pioneer’s Woman episode. Being a true fan of French desserts and French cuisine in general, I leave such simple skillet dessert without my attention. I love that with minimal amount of ingredients, you can transform any fruit in a buttery, crispy and delicious treat that is sure to become one of your family’s favorite desserts. Traditional Tarte Tatin is made of apples. But, I think any fruit will work beautifully in this recipe. Make sure to use oven-proof pan not wider that 10 inches in diameter. I love my Tarte Tatin to be warm, but if you want to enjoy it with a scoop of ice-cream, it’s better to cool a tarte down a bit. In the medium oven-proof skillet and on the high heat, melt butter and sugar. Add pears and allow them to brown on all sides for 6-7 minutes. Once pears have caramelised and nice and brown, take the skillet off the heat and let it cool. Roll out the dough between cling film, enough to cover the skillet. Arrange the pears neatly and lay the dough over the pears. Tuck in the edges. Remove from the oven and let the tarte rest for 5 minutes. Using a flat plate, place it over the tarte and quickly invert the skillet and plate together. Enjoy warm or cold with a scoop of ice-cream or whipped cream.